Malware Analysis: Let the Computer Do the Work! Malware analysts spend a lot of time analyzing code and looking for indicators of compromise from advanced persistent threats and even for the most seasoned analysts the volume of analysis can be prohibitive. In today's environment malware analysts need to leverage automated tools to power through large volumes of sample code and quickly receive valuable threat summaries. Letting the computers do the work allows the analyst to quickly identify files of greatest concern, and focus on remediating especially pernicious attacks. Malicious behavior can now be viewed right down to the kernel level, giving a complete picture of how your network was targeted by a specific cyber threat. Join Thomas Quinlan as he explores integrating automated threat assessment processes and defining indicators that identify specific threats to your system. 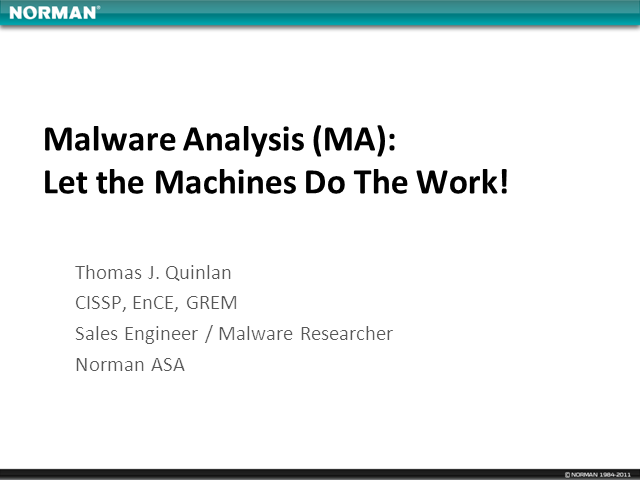 Title: Malware Analysis: Let the Computer Do the Work!